Tiffany pomegranate shade has wonderfully mottled deep green panels with a band of pomegranate in a lighter green with tips of pomegranates showing flashes of red when lit. 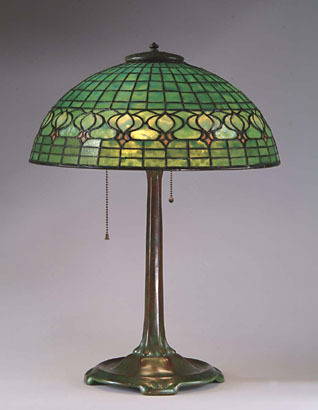 The shade is marked "Tiffany Studios New York" and rests on a wonderfully patinaed Tiffany base with three-socket cluster. The base patina is a rich red-brown with wonderful green highlights. Base is marked "Tiffany Studios New York 533". SIZE: Shade is 16" dia. Overall height is 21-3/4". ©2003,James D. Julia, all rights reserved.